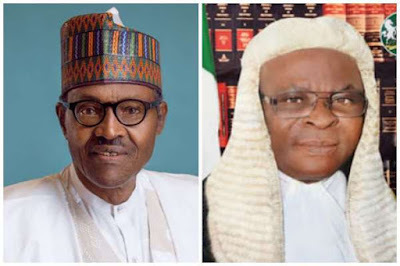 The All Progressives Congress (APC) said on Friday that the resignation of the suspended Chief Justice of Nigeria, Justice Walter Onnoghen has vindicated the action of the President and the stand of the party who earlier called for his resignation. National Publicity Secretary of the party, Mallam Lanre Issa-Onilu told newsmen that the resignation of the suspended CJN would have been the first step for him to take when it became obvious that he made a mistake of not properly declaring his assets as required by law. He said with the CJN standing trial for none declaration of assets and the previous trial of the Senate President for the same purpose, it is gradually becoming clear to public office holders that there is nobody above the law in the country. Onilu said a time is coming when a President who misbehaves will also be docked for wrong doing, stressing that all those who criticised the President for obeying the ruling of the Code of Conduct Tribunal will now realise that their action was not in their interest of the country. Onilu said: “The issue we have in this country is that, many people, especially those who have been part of the impunity of the past are struggling badly to adjust to the reality of rule of law. That is the major issue we are facing in this country. “There are so many struggles to allow the past. It is not good enough for us as a country to allow it go. All of us must rise and face the future; a future of promise and a future of change, so that we can move to the ‘Next Level’. “When this happened, the PDP and some of their allies in the Civil Societies read the barometer of politics and we do know that, until we rise above sentiments, no matter what part of the divide you find yourself, we must realise that this as an issue that has to do with our country. That is the only way we can progress. “We knew right from the beginning that what the allegations against the former Chief Justice of Nigeria were too serious to be swept under the carpet and we know that the President does not act on frivolities. “He must have done his background checks and must have gotten good information to have taken the action he took especially when there was basis for the action that can be legally proven. “[b]Those lawyers, so-called Senior Advocate of Nigeria who had over the years dip their hands along with some of these judicial officers into the till of this country, continued to lampoon the President, lampoon the APC and blaming this government that is doing its best to right several of the wrongs that we have been used to. “We were actually the one trying to deepen democracy and this party rose in the defense of the President because we understand what the President was doing and that he meant well, and we know the real purpose that drives his actions. “Now, events have proven the President right. Events have proven the party, APC right. Events have proven those Nigerians who believe Nigeria first and any other things after – events have proven them right. 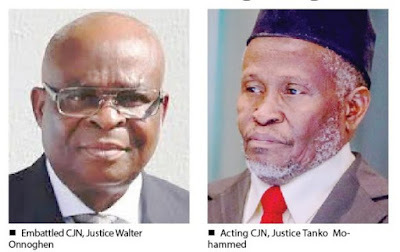 “We all can only be hiding behind one finger, otherwise we knew Nigerians, reasonable Nigerians knew from the word go that those allegations were not cooked up and if they were real, the next thing for the CJN to have done was to have stepped aside. If he had done that, the question of, he wouldn’t be the only one, why he should not have arisen? There is nowhere in the world where judgment is passed on every sinner at once. “It is not every armed robber you can catch the same day. And even some you know, the slow pace of justice may not catch up with them immediately, but we must continue to see evidence that we are moving towards that sanity and that we are making progressive efforts and sending strong signals to people who think this country must continue as long as they are comfortable and the rest of Nigerians are suffering. We must send that signal to them that it is not going to be business as usual.